That was a bad Monday for the 13-year old. At half past five in the morning, he was woken by his mother. "Your dad is going now. Do you still want to go?" Leeds was 65 miles from their home in Middlesbrough. But cricket was his first love. He said, "yes". Beef sandwiches for lunch. Tomato sandwiches for tea. His cycle had no gears. They arrived at Headingley to find that play had already started. Bradman had resumed his innings. He was batting on 271, trying to go past Hammond's world record score of 336. After six hours of cycling, there was no seat. He had to stand all day. Bradman could manage only 304. And then England lost four wickets in their second innings, staring at an innings defeat. They were eventually saved by rain. 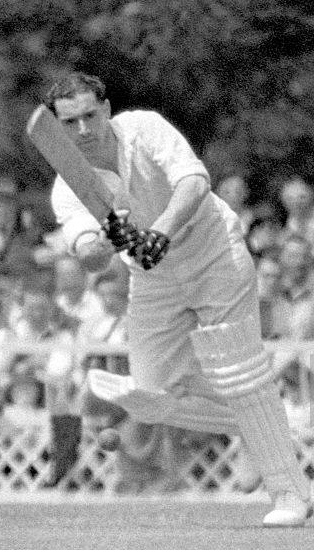 But for young Alan Townsend it was the first flavour of top level cricket. It was a hot day and on the way home, they stopped for drinks. Alan had a bottle of lemonade. It was nearly eight'o clock and there were another 60 miles to go. It was a lonely road, it rained badly, and they got drenched. At midnight, with 25 miles still to go, they found the fish and chip shop open. The biggest problem was that the roads were lonely and dark. A 13-year old cycling in that, with images of Bradman running through his mind. They reached home well after two'o clock. 130 miles of cycling and ,standing all day in the heat. But Bradman's drives and Cyril Walter's cuts were good enough to keep him going. On that very day, he decided that life without cricket wouldn't be worthwhile. He did well. Played over 300 first-class matches for Warwickshire. What if his mother failed to wake him up that Monday? Alan Townsend was born on this day in 1921.